One thing that I've taken away from working in fashion is that in most cases, you get what you pay for. A lot of work goes into selecting the fabrication, fitting, trims, etc (I've been in meetings where button sizes were argued to the next millimeter). When you really shell out for the good stuff, those things tend to last. So when I was in the market for a new sweater, I wanted to invest in a piece I knew would serve me season after season. 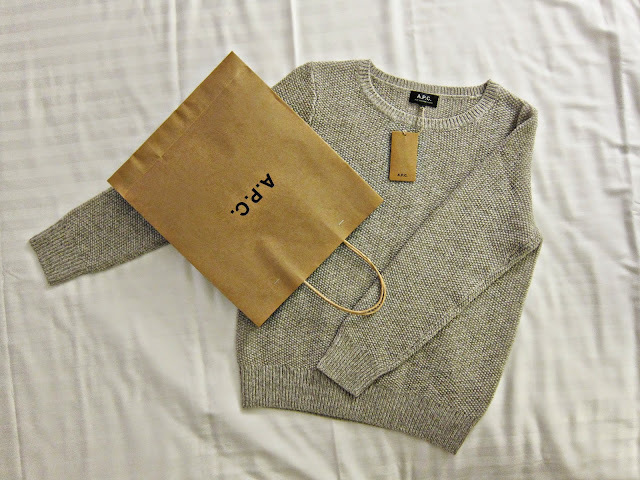 I had been eyeing a few items from A.P.C for a while, so on my latest trip to Berlin I finally plunked down and purchased this gorgeous "sport jumper". Feeling the thick merino wool between my hands was enough to do it for me, and the textured moss stitch definitely helped seal the deal. Not only have I been pairing this jumper with almost everything in my closet, but I've also become a master at dodging spills and eating my pasta very, very, carefully.